The image of the eternal flame is used in many cultures as a continuous visual reminder of generations past. It is a particularly significant emblem in Jewish culture and is used religiously in Jewish synagogues: the ‘ner tamid’ hangs close to the Torah scrolls, representing their guiding light. Just as the eternal flame can never be extinguished, neither can the faces of the holocaust ever be forgotten; Grey’s ‘Flame of Remembrance’ ensures that the plight of the Jewish people is remembered eternally. By carving discernible features into the faces and including details such as kippah’s, men’s facial hair, women’s headdresses and variant lengths and styles of hair, Grey has given each Jewish face an identity. This evokes a closeness and familiarity between the viewer and the face and gives the work multiple narratives. Each face becomes a real person with their own tale to tell of the holocaust and its horrors. Grey reminds us of the fact that the Jews who were killed during the holocaust are not just a mass figure to be quoted from history books, but individuals who were husbands, wives, parents and children. 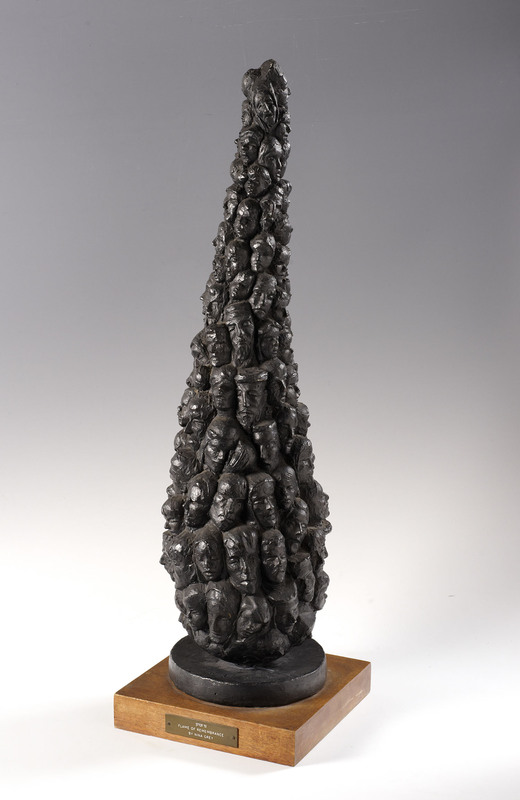 Another version of this work was exhibited at St Martin's School of Art, where Grey had been a pupil, in 1961, before being cast in bronze and sent to Israel.